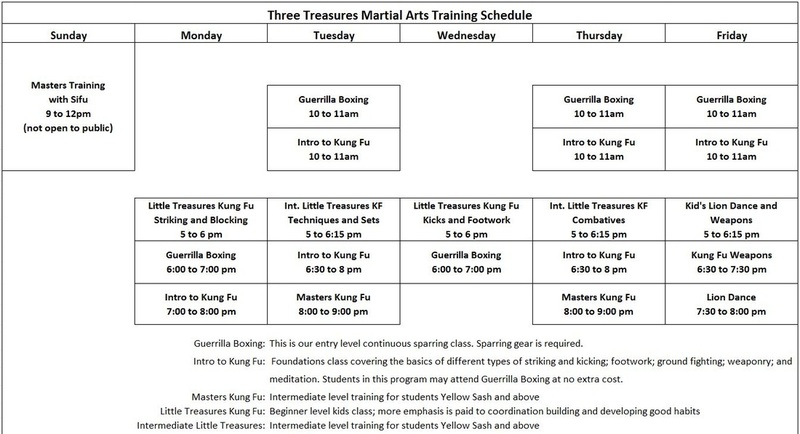 This is our schedule for new and beginner students. As you improve, you will be invited to higher level classes that are not on here. Sifu Du values the short amount of time his students and staff can devote to training therefore it's only fair that he remain as devoted to his current students as possible. Out of respect we ask that you contact us via email or voice mail so we can set up a time to talk to you privately about your goals before inviting you to come see our training. Please read the expectations on our Registration Process page. These expectations are meant to protect the harmony of the school and pass down good training habits. Do You Do Contracts? We do not use contracts. We feel if you enjoy the training and are getting value out of it, that is enough to maintain your loyalty to us. Do You Allow Cross Training With Other Schools? Only Sifu's direct students are allowed to cross-train with other schools. This is considered an honor as well as a big responsibility. Regular students are not allowed due to them possibly not understanding proper protocol. We want to avoid possible conflict with other schools. Who Is Allowed to Teach Your Kung Fu Classes? Sifu Du is the only instructor at Three Treasures. He is sometimes assisted by experienced students who train directly with him. ​What Is Your Loyalty Policy? We feel loyalty should work both ways. Quality training does not need to be expensive. We are committed to never raising your current rates for as long as you are a current student.The longer you train with us, the better the value. Do You Teach Ground Fighting? Many Kung Fu and Karate schools will use the words "ground fighting" to make you believe you will learn Jiu Jitsu. We cross train and learn from Primal Jiu Jitsu in Mira Mesa and we recommend them if you are looking for a deeper understanding of ground fighting. What's the difference between self-defense and sport fighting? On the streets, there are no rules and it is a highly different mental stress when you are attacked without warning versus having months to prepare for a tournament and knowing you probably won't die because of those rules, referee and sparring gear. The flexibility of what we teach is you can take our self-dense techniques and apply them to sport fighting. But oftentimes, sport fighting is impractical for self-defense or lack the well-rounded curriculum you may need.